I am pleased to be in link with all of you, the great Admirers and Viewers of this page on the Web-site of our most cherished Institution, ‘Sri Sarada Niketan College for Women’, Thenjeyarambadi, Amaravathipudur, Karaikudi, Tamilnadu- 630301. I feel blessed to be the part of the Institution in the name of Sri Sarada Annaiyar. Bountiful blessings of Annaiyar amplified by the flow of benevolences of Bhagavan Ramakrishna Paramahamsa and the magnificent wisdom of Swami Vivekananda, make the institution serene and scintillating committed to steadfast spreading of Service, Education, Excellence & Divinity (SEED). The spiritual tinged service to the humanity of our revered 'Secretary & Correspondent' of the College, Swami Atmananda Maharaj is the guiding undercurrent that has blessed the Institution with so much development, in so short a time and to so great delight of all of us. In its 18 year (1997-2015) sojourn, the College has seen commendable glow and gleam. The College has got the coveted permanent affiliation status from the affiliating institution, the esteemed, 'Alagappa University, Karaikudi', a State University in Tamilnadu accredited with ‘A’ grade by National Assessment Accreditation Council (NAAC), a body under the University Grants Commission (UGC), New Delhi. Besides, the College has got the UGC’s (the apex body funding and tending higher education in our nation) recognition under sections 2(f) and 12(B) of the UGC Act 1956, in June, 2012. As a result, the credentials of our College have got the stamp of approval by the UGC, the nation’s higher education body, facilitating our faculty members and students/ scholars to avail financial assistance and other eligible support from the UGC and other designated Government Institutions. It is a moment of achievement, happiness and proud. It is my pleasure and fine sense to place on record our gratitude to the esteemed UGC and reverence to valued Alagappa University. During the period 05.02.2015 to 07.02.2015, the esteemed NAAC peer team visited our college and assessed our performance. We are very proud and happy to record that our Institution obtained NAAC ACCREDITATION WITH ‘B’ GRADE. It is my pleasure and privilege to place on record my sincere thanks and appreciation to all the faculty members, Students, Members of IQAC, Alumni and all the stake holders of the Institution. I also place on record my gratitude to the revered Correspondent and Secretary for his exemplary support. Our Vision is 'Harmony of Head, Heart and Hand (HHHH)'. Head is the Intellectual execution part, Hand is the physical execution part and Heart is the Empathizing part. In Bhagavad Gita, Lord Krisna says: Perform your duties, for action is superior to inaction; Act for the sake of sacrifice, without personal attachment to result; For, by action without attachment a man attains the Almighty. The Lord Himself stood (stands, as well) an example of a doer without attachment. Our values speak of our quality as human beings with superior purpose. Dedication to all our meaningful actions is needed, for through unwavering dedication only can one reach the divinity and enjoy the divine bliss or delight. Our goals must be outstanding performance in every domain or place or time resulting in an opulent ocean of fine outcomes that everyone envies to do. In the process our national / cultural symbols of Righteousness, Religiousness, Resourcefulness and Respectfulness must be kept beyond compromise. Finally, our Accomplishments come which should be novel (ingenuity and inventive), niches (positioned to the likes of everyone) delivered nicely to nest in the hearts of everyone we choose to serve. Our Ambition, Values, Goals, Symbols and Accomplishments are supreme. We must elevate ourselves to deliver these in best form. I wish you all good and pray the Almighty for His best of benediction to every one of us. 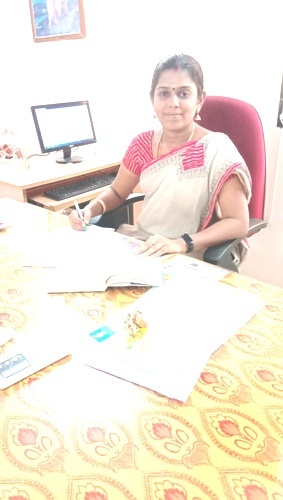 DR.S.SELVARANI , M.Sc, M.Ed, Ph.D. has been working as Principal of SSNC, since Jan 2003.
' Professional Excellence Award ' : Thavathiru Kundrakudi Adigalar Education Trust in 2014.
' Best Presenter Award ' : Conference of 9th Tamilnadu State Science Congress in 2009.
' Best Citizen of India Award (2005-06) ', by International Publishing House, New Delhi. Determinants of the Performance of TN Candidates in Civil Services Examination. Member of the Academic Council, Madurai Kamaraj University during 2003-04 as Governor’s Nominee. Presented a paper in an International Conference held at Los Angeles, USA on 16th May 2014. Presented more than 30 papers in National and International Seminars and Conferences. Had written more than 30 articles in National level magazines and Newspapers.